People are crazy about their pets. Diamond tiaras, cat condos, doggie daycares serving gourmet kibble, anti-depressants and acupuncture for the unstable pet in your life — all this and more is available for Mr. Wiggles or Li’l Boots. After all, they’re not simply a dog or a cat — they’re family. Current statistics, trend analysis, and the recurring crazy stories bear this out. Considering that pets replace children for many, it follows that we treat these family members with the same kind of concern we normally reserve for our human brethren. But our animal companions are mortal too and so it follows that an end-of-life plan is just one of the many ways we can show how much we care for that beloved pet. I remember seeing the captivating Errol Morris documentary, Gates of Heaven, years ago. As many reviewers have suggested, this isn’t just a documentary about pet cemeteries; it’s about the human condition. By turns funny, tragic and bizarre, the film captures and distills emotional truth in a compelling narrative. Roger Ebert named it one of the 10 best films of all-time. 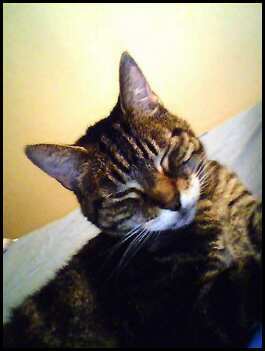 On a personal note, Squeakers, my own feline companion of seventeen years, died last year. I chose cremation over burial or any other number of ways I could have memorialized my pet. Call me dispassionate or cheap, but I just couldn’t see forking over a small fortune to memorialize my cat for eternity. Thinking I would receive a bag of ashes and a bill, I was actually taken aback when I got the call from the vet to come and pick her up. Instead of the ziplock bag I was expecting, I received a small box, covered in hand-made paper, embedded with pressed flowers. Attached to the box was a card and an envelope. The card was signed by the entire veterinary staff, with wishes of condolence flowing out. And the most unexpected of all? A tiny plastic bag (like the kind that comes with an extra button for a new blouse) containing a chunk of her fur and a small piece of card-stock paper with her inked paw-print — her inked paw print! What the? These intimate and personal touches took me by surprise. I guess it kind of freaked me out. I didn’t authorize the cutting of fur and the inking of paws. But I guess that’s how things are done when no specifications are given. Not that I was angry — if anything, I was a little miffed that the box containing the ashes was hot-glued shut. I guess they thought viewing the ashes would be too much too bear. So being the curious sort, I took a knife and opened it up. I had to see what was left of old Squeaks. As expected, they pretty much looked like all the other cremains I’ve seen. Call me cold, but they are now sitting unceremoniously in a box in my storage unit on the outskirts of Portland. But really, is that pile of dust Squeakers anyhow? Doesn’t she live on in my memory and more gloriously in the photo above? I’d like to think so. If you want to learn more about pets and death, search your local library catalogue under such terms as pet death, pet loss, pets and grief, pets and bereavement, etc. Posted by Kim in Cemeteries, cremation, Funeral Industry, Monuments + Memorials and tagged animals, pets. Bookmark the permalink.